Paul joined his family brewery in 1964, and just five years later, when his father died, had to defend it from being sold. He became managing director at the age of 24 and under his auspices the business flourished. However, in 1988, Theakston’s was sold to the national brewers Scottish & Newcastle, and Paul, who had been opposed to the sale, left to pursue other business interests, free from big-brewery control. Regardless of the decline in British manufacturing in general and brewing in particular, and undaunted by eye-wateringly high borrowing rates, Paul sealed a deal and bought a disused maltings in Masham. Situated cheek-by-jowl with his old family brewery, he painstakingly converted the maltings into a new brewery complete with shop, bistro and bar. For the beer, he insisted on the very best ingredients — whole hops, rather than hop oil or pellets, top quality Maris Otter malt and water drawn from deep below the brewery. The Black Sheep Brewery, as it was ingeniously named, brewed its first beer in autumn 1992, and the values and principles have remained unchanged. 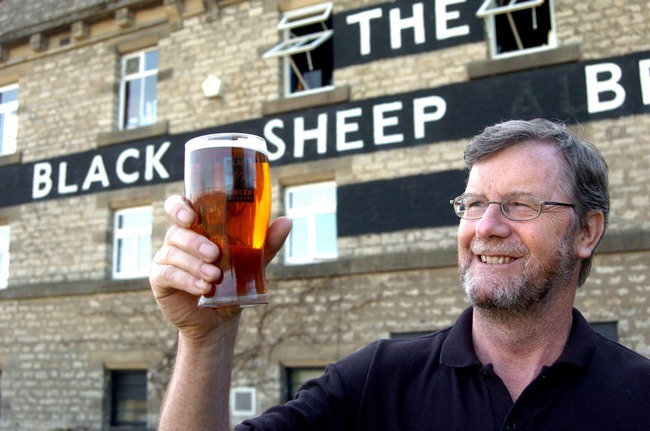 Paul’s unstinting passion for brewing and his commitment to family and employees, the local community and Yorkshire region can, as many claim, be tasted in every pint of Black Sheep beer. He recently became chairman of the brewery, handing over the reins to two of his sons, Rob as managing director and Jo as sales and marketing director. The lifetime achievement award recognised how Black Sheep had — remarkably — achieved such huge success without owning a single pub, and with all the focus on brewing. There are now lots of breweries springing up and following suit, but at the time Paul built his brewery, no-one else was doing it, and most people were extremely dubious. He has proved them wrong and gone on to become a shining example to brewers up and down the country, helping out whenever he has the time, and lobbying vigorously against unfair taxes on beer and for all measures that support British brewing and great pubs. “It was a huge honour, as well as a great shock, to be presented with this award. I’d gone along to the event to put the case for Yorkshire brewing and pubs to any MP or Peer who cared to listen, and was utterly astonished to find myself at the centre of attention! “The accolades shouldn’t be for me alone. I have had tremendous support all the way through. I’d like to thanks all those who showed faith in the idea at the beginning, who trusted me to turn the idea into a reality and who have supported the venture along the way. Paul Theakston, Black Sheep Brewery.